Kids Birthday parties are what we look forward to as child. It is a time of the year when friends and relatives get together, and enjoy the fun, food, games, and each other’s company. 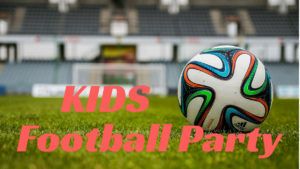 We have football Party ideas to have a themed birthday party for your kids that will surely make it a great day. Why not try the most popular sports in the world – football. A Football Party Ideas you can have your little boy as team captain, along with his other friends as players or officials. And if he wants to invite his girl friends over, they can be cheerleaders. Here are other fantastic and creative party ideas that your child will surely treasure and love you more for. You can also have football cards as invitations, so guests could start a collection, or trade each other’s cards at the party. Use your child’s favorite team’s color as the party theme. You can also hang balloons and streamers or a personalized football-filled banner with a “Happy Birthday” Fill the walls and party area with football items like jerseys, hats, balls, pictures of famous players, and flags. Design the area to look like a football field. If you have artificial grass, football goals, footballs and other sports equipment this keep the theme going. A presentation at the end can bring everybody together for a final applause and words spoken of thanks to everybody for coming to the event and making it fun.